All games in tagged with "NCAA Basketball"
NCAA Basketball - known as World League Basketball in Europe and Super Dunk Shot (スーパーダンクショット?) in Japan - is a basketball video game which was developed by Sculptured Software for the Super NES.It was the first basketball game for a console to utilize a 3D perspective. 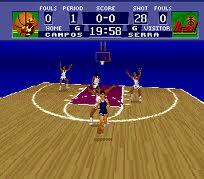 The game uses the Super Nintendo's Mode 7 to create a 3D players' perspective that became the standard for later basketball video games. Sculptured's NHL Stanley Cup featured a similar effect.According to short-lived Flux magazine, which originated in the United States, this video game was declared to be the 75th best video game of all time.